NGC will now offer automatic encapsulation services for coins with detrimental surface conditions, with no additional charge. Read on for more details. Starting September 1, 2009, NGC will begin encapsulating coins with detrimental surface conditions using details grades and descriptions of their impairments. This service will be provided automatically for all NGC grading tier submissions at no additional service charge. The authenticity of details graded coins will be covered by the updated NGC Coin Grading Guarantee, and coins graded under this program will be encapsulated with a distinctive purple NGC Details Grading label. 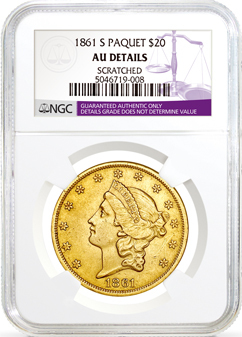 An NGC details graded coin. Coins that previously would have been returned ungraded by NGC, as so-called "No Grades," will now be assigned a details grade that accords with their level of surface wear, such as VG DETAILS or XF DETAILS, when submitted for grading. Coins that have no wear but still display a problem surface condition will be labeled as UNC DETAILS or, in the case of Proof coins, simply PROOF. Following the details grade will be a description of the noteworthy surface condition, including, for example, Improperly Cleaned, Artificial Color, Environmental Damage and Tooled. A detailed guidebook available in hard copy and on NGC's Web site called Understanding NGC Details Grading will define all the terms used by NGC to describe these surface conditions. "NGC Details Grading allows us to provide the best experience possible for our submitters. Now as many coins as possible will be returned certified and encapsulated, meaning that they are covered by the NGC Guarantee. NGC Details Grading also provides comprehensive descriptive information for coins with surface problems, making them easier to buy and sell," comments Rick Montgomery, President of NGC. Once this service option begins on September 1, 2009, coins submitted to NGC will be graded either numerically (if they have acceptable surfaces) or with Details Grading, at the discretion of NGC's grading team. It is not necessary for the submitter to declare which service is desired, as this will be determined automatically by NGC. While new NGC submission forms will permit submitters to opt out of Details Grading in favor of simply having the coin returned unholdered, NGC believes that its Details Grading certifications will find broad acceptance in the coin market. This opt-out feature is available on a submission-by-submission basis by checking the appropriate box on the submission form, or an account holder may arrange to make this opt-out feature automatically applied to all submissions on his account. In the past, coins with problematic surface conditions were given Details Grades and were encapsulated by NGC's affiliated conservation company, Numismatic Conservation Services (NCS). This service is being discontinued concurrent with the launch of NGC Details Grading, and all coins that were previously eligible for encapsulation at NCS will be certified by NGC under the Details Grading service. A new NCS CrossOver service is being introduced for $5 per coin. NCS-encapsulated coins can be details graded and encapsulated by NGC for this low service fee. Note that coins previously described as Genuine by NCS will be assigned details grades by NGC, and their surface conditions will be disclosed on the NGC Details Grading label. Should a submitter desire NGC Details Grading for coins previously returned as "No Grades" from NGC, they must be sent raw as new submissions for details grading; no discount is available for these re-submissions. As with numerically-graded NGC coins, details graded coins will be encapsulated with the EdgeView holder using standard white inserts. Coins will be photographed prior to shipment and their images and coin details can be reviewed using NGC online certification verification tool. The Scratch-Resistant EdgeView® Holder will be used for all Express tier and higher submissions. The full suite of US and World coins, tokens, medals and mint errors now graded by NGC will be eligible for NGC Details Grading. Details graded coins can also have varieties noted on their certification labels. All the varieties recognized in NGC's variety attribution program, VarietyPlus®, can be noted on the NGC Details Grading label, just as they would for numerically-graded coins. Details graded coins will also be eligible for inclusion in the NGC Registry. In competitive Registry sets, they will receive 50% of the point value assigned to a numerically-graded coin of corresponding detail. For example, an XF DETAILS graded coin will receive 50% of the score assigned to an XF40 graded coin. For more information about NGC Details Grading visit www.NGCcoin.com/details or contact NGC Customer Service with any questions or comments at service@NGCcoin.com or 1-800-NGC-COIN.